Welcome to Fish Window Cleaning Modesto, Turlock, Ceres, Hughson, and Denair, CA! We provide free on-site estimates. You may wonder why we don’t provide estimates over the phone. It is important to us that we provide you with an accurate and fair estimate. In order to do this, it is necessary for us to thoroughly inspect all of your windows. Windows come in many different sizes with a varying number of panes. Some may need to be disassembled or may have obstructions near them. Once we know exactly what needs to be done, we can then relay that information to our cleaners to ensure that they bring the right equipment. We are true professionals and we take our work seriously. Our team is bonded and insured. We are trained and uniformed professionals. We offer customizable cleaning schedules. You can trust us to take great care of your home or business. We know that you have a to-do list a mile long and window cleaning is probably not at the top of that list. While cleaning the windows is often put off because it's such a time consuming task and can even be dangerous, it's a very important part of keeping your house looking its best! Let us handle the hard work for you and make all of the windows in your home sparkle! We respect your home by wearing clean shoe covers and using absorbent cloth pads under your windows to protect your carpet and wood floors. We even introduce you to our friendly, professional team so you know exactly who is making your windows shine! Your windows and glass doors are the first thing your customers will see so let us help give them a great first impression. As business owners, we understand the needs of other business owners. Fish Window Cleaning was founded in 1978 so we realize how important it is to tailor our services to meet your specific needs, budget, and schedule. Whether your business is a restaurant, a church, an office building, or a store we can make all of your windows sparkle. We also know that our appearance reflects on you. That's why our window cleaners are uniformed and professional. 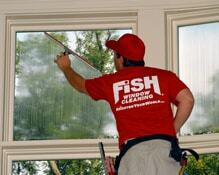 Our team is bonded and insured so there's nothing to worry about when you hire Fish Window Cleaning!